- One size fits all for your yoga & pilates mat. - Non-skid, slip free, sweat aborbing and light, great for Bikram and Ashtanga yoga. - Grips even more when damp during hot yoga..
- Perfect for Gaiam, Lululemon Jade, Manduka, Aurorae, Kulae, Orla Kiely, Bean, Timbuk2 and Hugger Mugger mats. - Eco-friendly towel which use less water & energy to wash.
- Soaks up any perspiration asap due to it's fast-drying 100% microfiber material. - Made from lightweight premium 100% microfiber material. - Multi-purpose towel - can also be used as a premium bath towel and a beach towel. - Your friends and family will be wondering why you didn't buy them one too Got a question? Ask us now in the "Customer Questions & Answers" near the end of this page. Same design as our WILDLY POPULAR Original Yoga Towel! Now with corner pockets for EVEN BETTER STABILITY! 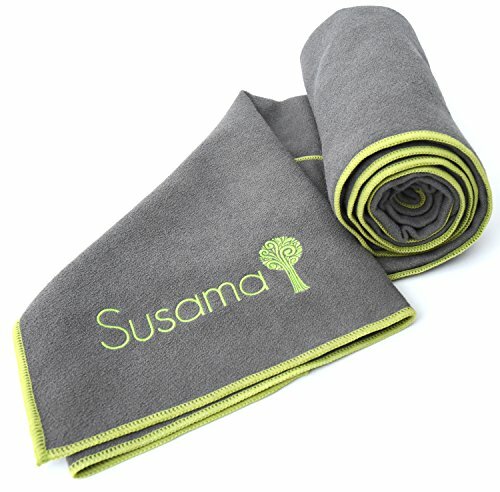 MACHINE WASHABLE: The premium Susama towel is quick dry, eco- friendly, machine washable, 100% awesome and easy to care for & wash. Full size: 24 inches x 72 inches. AWESOME BIRTHDAY PRESENT - KEEP YOUR SWEAT UNDER CONTROL: Enjoy feeling fresh and clean while you exercise with this large, suede, hygenic, 100% Microfiber, Super Absorbant, Non Slip, super Light, quick dry, eco-friendly towel. Perfect for the gym, working out, cooling off, fitness, cycling, travelling, camping, playing golf, swimming, bath, kayaking, surfing, backpacking and hiking. If you have any questions about this product by Susama Yoga & Sports, contact us by completing and submitting the form below. If you are looking for a specif part number, please include it with your message.